Born in Japan, Corcoran's early days of skiing were spent at Mont Tremblant in Quebec. Corcoran's uncle Thomas Gardiner Corcoran was an advisor to President Franklin Roosevelt. Corcoran attended Phillips Exeter Academy in New Hampshire and found himself ski racing on the Mt. Tecumseh Trail in Waterville Valley. After graduating from Dartmouth College and heading to Aspen, Corcoran represented the United States ski team in the 1956 Winter Olympics in Cortina. Corcoran then served as an officer in the Navy and earned his MBA from Harvard Business School in 1959. 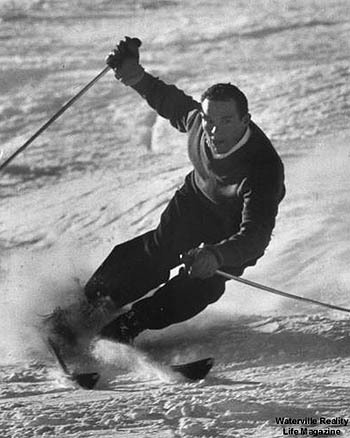 In 1960, Corcoran placed fourth in the Giant Slalom at Winter Olympics at Squaw Valley. In the early 1960s, Corcoran worked for the Aspen Skiing Corporation and soon became good friends with Robert F. Kennedy. In 1964, Corcoran volunteered on Kennedy's Senate campaign. At the urging of Senator Kennedy, Corcoran starting searching for a place to build his own ski resort. After looking at potential locations in New York and Vermont, Corcoran conducted an aerial survey of Ragged Mountain, the Sawyer River Skiway, and Mt. Tecumseh, favoring the latter. Reportedly with the help of Senator Kennedy, Corcoran secured the funding and United States Forest Service permit to construct a grand resort. Corcoran's Waterville Company, Inc. purchased most of the privately owned land in the town of Waterville Valley, starting trail construction in early 1966. During the planning and initial construction phases, Corcoran continued to ski race. Waterville Valley ski area opened on Mt. Tecumseh for the 1966-67 season with four double chairlifts and a J-Bar, while nearby Snow's Mountain remained operational with two T-Bars. With the new lifts being Stadeli, Corcoran would become a United States seller of the brand. Also in the late 1960s, Corcoran was involved in starting the NASTAR racing organization. In 1970, Corcoran was involved in initial planning for a ski area on Mt. Tom in Crawford Notch. Waterville became a popular ski destination for racers and celebrities alike. Through the years, Corcoran joined popular figures such as the then-President Carter's daughter Amy, as well as the Kennedys, on the slopes. Bobby's Run was named in honor of late Senator Robert Kennedy. The ski area underwent a massive expansion project in 1977-78 with financing from Manchester Bank. In addition to the installation of a top to bottom snowmaking system, the area expanded its main lodge and added a triple chairlift. Also that year, Corcoran ramped up the area's cross country ski operations after a visit to Mte. St. Anne in Quebec. In the fall of 1979, Corcoran led a group of investors that bought out the assets of Bobcat ski area, later known as Crotched West. Crotched West would soon be merged with Crotched East, forming a united Crotched Mountain. Corcoran would sell his ownership stake in the 1980s. Waterville's first high speed detachable chairlift was installed for the 1988-89 season, initially serving the entire area. The lift would later be truncated due to wind issues. Swamped with $6 million in debt (much of it held by the FDIC after two bank failures), the Waterville Company, Inc. filed for Chapter 11 bankruptcy in June 1994. The company emerged from bankruptcy later that year, when it sold the ski area and conference center to S-K-I Ltd. for $10 million. The area would soon be sold to Booth Creek and would see years of declining skier visit numbers. In addition to serving as a selectman for Waterville Valley for over three decades, Corcoran was also president of the Eastern Ski Areas Association and chairman of the National Ski Areas Association. He is a member of the United States Ski Hall of Fame. Corocoran stepped down from every day management of the Waterville Company, Inc. in 1999, but remained chairman of the company for many years thereafter. Corcoran passed away at his home in South Carolina on June 27, 2017.